Orbital Sciences' Antares rocket stands atop the launch pad at NASA's Wallops Flight Facility on Wallops Island, Va., for a planned Jan. 8, 2014 launch to the International Space Station. The Orb-1 mission is the first official Cygnus cargo mission by Orbital for NASA. WALLOPS ISLAND, Va. — A commercial spacecraft bound for the International Space Station is cleared to launch from Virginia's frigid Eastern Shore Wednesday (Jan. 8) in a milestone delivery mission for its builder, Orbital Sciences Corp. The unmanned Cygnus cargo ship is slated to blast off Wednesday at 1:32 p.m. EST (1832 GMT) on the first Orbital Sciences resupply mission under a $1.9 billion contract between the company and NASA. The gleaming silver spacecraft will launch atop an Antares rocket, also built by Orbital Sciences, from a pad here at NASA's Wallops Flight Facility. Orbital's Cygnus spacecraft is packed with 2,780 pounds (1,260 kilograms) of supplies for the six astronauts on the space station. That haul includes a veritable cornucopia of science experiments for the crew, including 33 tiny cubesat satellites to be launched from the station and 23 experiments designed by students on Earth. The spacecraft is also carrying a space ant farm to study how ants behave in weightlessness — an experiment to study the ants' swarm intelligence that could help improve mathematical procedures for solving complex problems, NASA officials said. The Dulles, Va.-based Orbital Sciences hoped to launch the Cygnus mission, called Orb-1, to the space station in mid-December, but an unrelated cooling system malfunction on the orbiting lab forced NASA to delay the flight while astronauts performed emergency spacewalk repairs. Orbital later rescheduled the launch for Jan. 7, then delayed the mission due to the extreme freezing temperatures blanketing much of the United States this week. "The extended cold temperatures definitely produce some unique challenges for us," Orbital's Antares rocket program director Mike Pinkston told reporters. Orbital launch rules require temperatures of at least 20 degrees Fahrenheit (minus 6 degrees Celsius) in order to fly. Over the last few days, Orbital technicians have weathered sub-freezing temperatures and biting wind-chill by working in shorter shifts and taking shelter in a heated truck when needed. "The main thing is keeping everybody warm and safe, with no frostbite," Pinkston said. 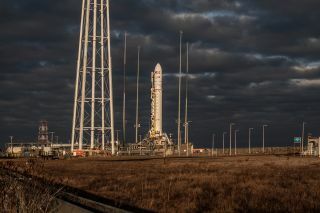 Wednesday is forecast to be warmer, however, and officials say there's a 95 percent chance that the weather will be good enough for the Antares to get off the ground. Orbital Sciences is one of two commercial spaceflight companies tapped by NASA to fly unmanned cargo delivery mission to the space station under billion-dollar contracts. The other company is Hawthorne, Calif.-based SpaceX, which has launched two of 12 missions to the station using its Falcon 9 rockets and Dragon space capsules. Orbital's first Antares rocket and Cygnus test flights launched in 2013, but Wednesday's mission will mark the company's first of eight official delivery missions under its $1.9 billion contract with NASA. Orbital Sciences' Antares rocket stands atop the launch pad in freezing temperatures at NASA's Wallops Flight Facility on Wallops Island, Va., for a planned Jan. 8, 2014 launch to the International Space Station. The Orb-1 mission comes on the heels of a Monday SpaceX launch of a Falcon 9 rocket from Florida. That mission lofted the commercial Thaicom 6 communications satellite into orbit from Cape Canaveral Air Force Station — the first commercial launch of 2014. "This is going to be a big week for spaceflight in the U.S.," said Orbital executive vice president Frank Culbertson, a former NASA astronaut, as he congratulated SpaceX's successful launch. "I think you're going to see that the United States is going to build up our launch rate." NASA retired its space shuttle fleet in 2011 and now relies on Orbital Sciences and SpaceX to launch delivery missions to the space station. The U.S. agency is also reliant on cargo ships launched by Russia, Japan and Europe to keep the station stocked, and Russian Soyuz spacecraft to ferry astronauts to and from the orbiting lab. NASA plans to rely on U.S.-built commercial spacecraft to fly American astronauts to the space station once they become available.